Ronda Rousey has had a great run with WWE thus far. She made her debut back in April at WrestleMania 34. Rousey teamed up with Kurt Angle and defeated Triple H and Stephanie McMahon in a Mixed Tag Team match. “The Rowdy One” returned to the ring at the Money In The Bank (MITB) pay-per-view (PPV). Rousey took on Nia Jax for the RAW Women’s Championship. It looked as though Rousey was about to win the title, when Alexa Bliss crashed the party with her MITB briefcase. After attacking both Jax and Rousey, Bliss cashed-in her briefcase and won the RAW Women’s Title. This weekend at SummerSlam, Rousey gets her shot at redemption when she takes on Bliss for the strap. Rousey spoke to AMNY.com to promote this weekend’s Brooklyn event. During the conversation Ronda Rousey opens up about her friendship with fellow WWE star Natalya. “I’ve known Nattie years before I started wrestling. She teaches me so much technically, obviously but I was coming into a new environment, I was nervous and felt like the new kid in school,” Rousey said. 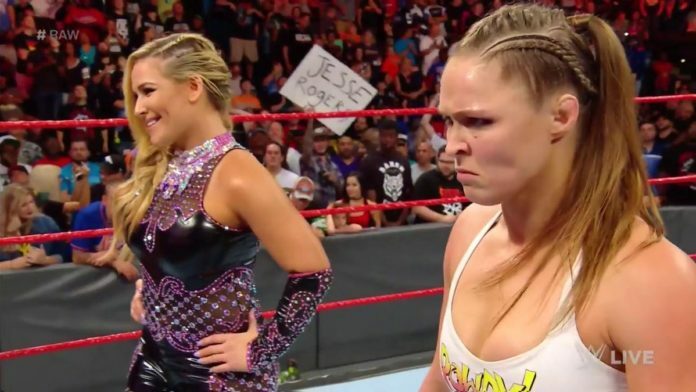 Discussion: What do you think about Rousey’s comments regarding her friendship with Natalya? Let us know in the comments below!